A set of propositions and an accompanying theoretical framework that explains the cause-effect linkages between intrastate and interstate power realization that are characterized by militarization are developed. This model establishes the foundation for an explanation of how such power is used to deal with the state's Janus-faced security dilemma. To this end, the model provides the tools needed for such an inquiry from a conceptual and typological standpoint. The goal is to explain how the internal aspect of state power shapes the external one. 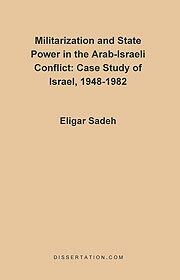 It was determined that Israel and the primary Arab confrontation states provide important test cases based on the intense interplay prevalent between militarization processes and state power.